sometimes you hear about restaurants in passing, or while perusing the pages of time out on the tube, and they sort of go into your "must-visit" list and then promptly get forgotten about. 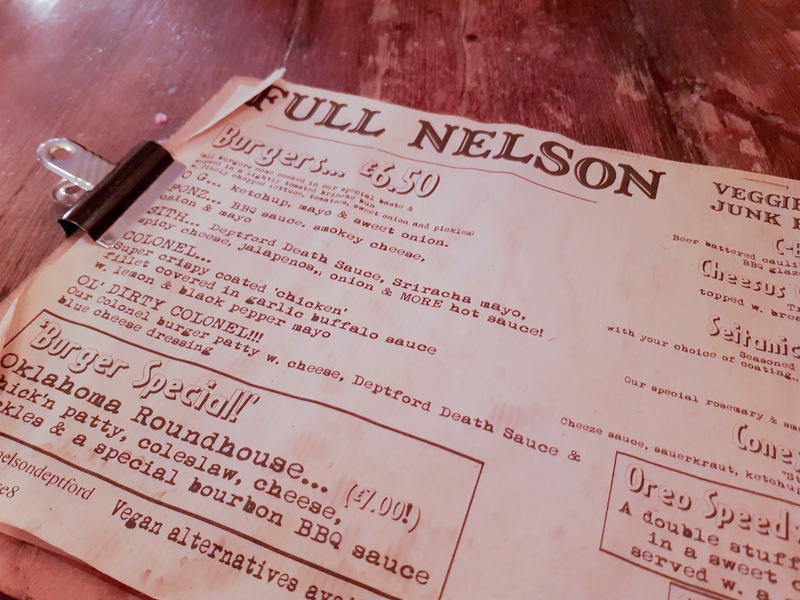 the full nelson was one of those restaurants. well, pub. well, no, it's a "kitchen" according to their website. but on entry, it mainly just seems like a bit of a galley. it's small, man, really small, but it packs a punch, that's for sure. 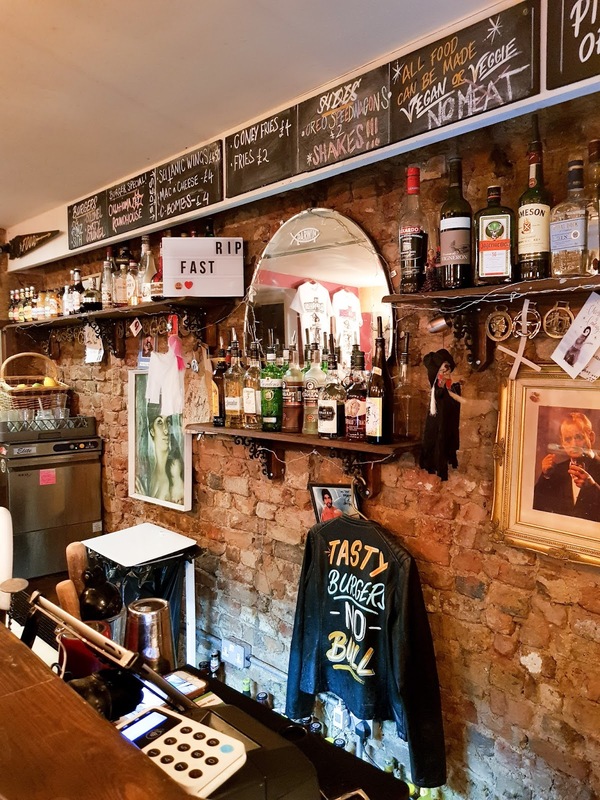 (that's sort of a play on words, cos "full nelson" is a wrestling move, and the place is a bit of a shrine to the wwe, but i don't really know why.. there's no explanation! )(do they punch in wrestling? i don't even know). 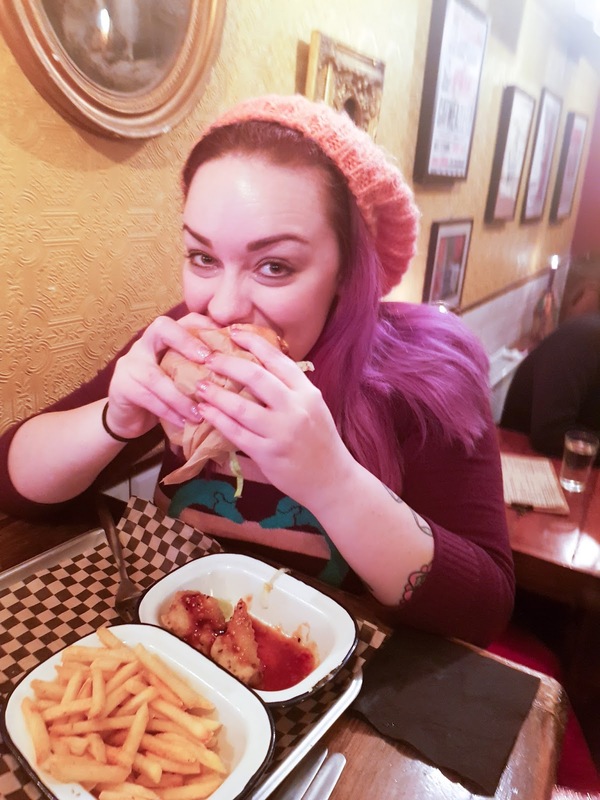 i'd convinced rebekah to come visit it with me over the weekend, by bribing her with doggo cuddles, and together we ventured down to deptford for a right good veggie knees up! i'd heard a lot about seitan in general, both good and bad, so was curious to try it out myself. the hardest thing on this vegan journey has been trying to "substitute" certain meats with a new food, especially when that new food doesn't have the same texture of the original. truly, you think it'd be mind over matter but it's not. it's really not. you can't dissociate texture from taste when you're trying to change a habit, so it's really best to try and enjoy the new thing for what it is. seitan, though..? i'm not sure. also known as "wheat meat", seitan is similar to tofu in how it's cooked, but it's also the closest you can get to the texture of chicken. of course, it tastes nothing like chicken - weird, considering everything tastes like chicken, but i guess that's why they deep fry the stuff and slather it in sauce. we went with the teriyaki, but didn't rate it. we had the chilli bbq on the side and it was much better! 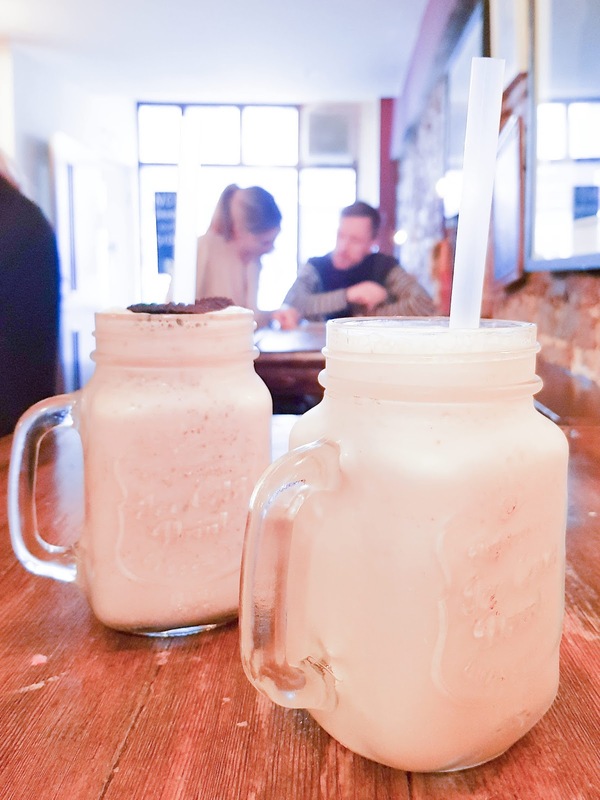 omggggg best non-dairy milkshake i've ever had! 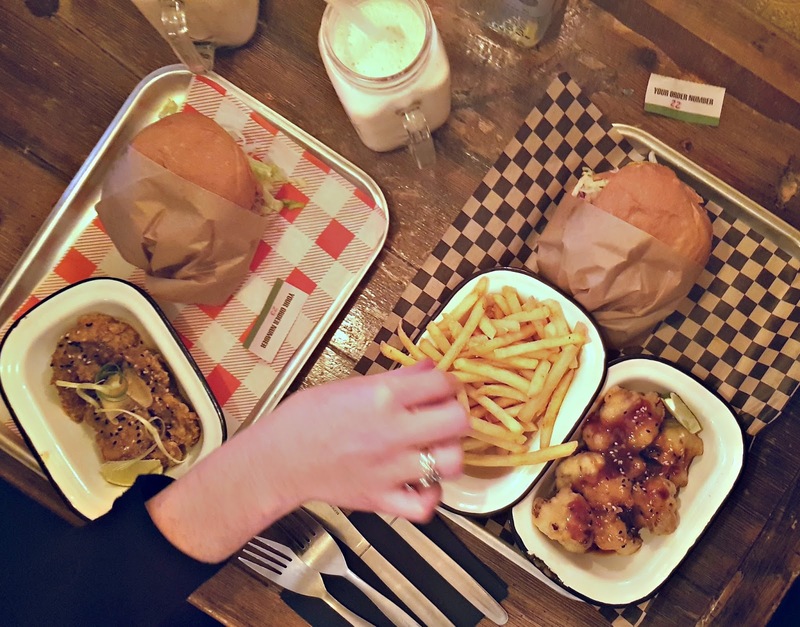 the "kitchen" specialises in both veggie and vegan junk foods, so you can specify dairy or not, and we both went for not. rebekah had the peanut butter and oreo shake, but i went nice and simple with a vanilla and maple concoction. it was deeeelish! so sweet and creamy, and no weird aftertaste that you sometimes get with alternatives - at all. it was the greatest surprise to me, and i will definitely be back for another of those! 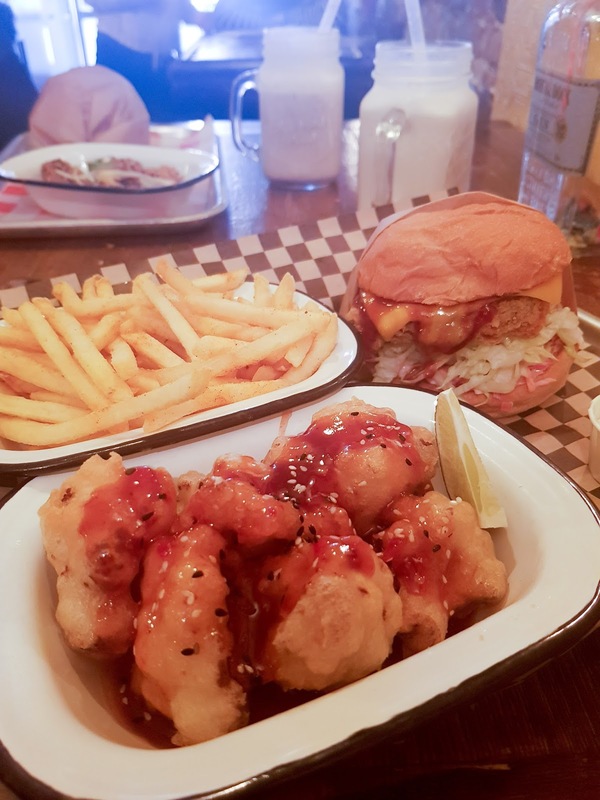 shocker of the day was the beer-battered cauliflower florets served in a chilli-bbq sauce on the side of my burger. seriously, cauliflower has really upped its game from the good old days when you had to cover it with cheese to just make it edible, because right now it's about 40% of my diet. out of choice. i'm loving how versatile cauli is - for soup, curry, rice, pasta (!) - you name is, cauli can be in it, but this is one thing i had nevvvveeeeerrrrrrr considered doing to it, and i regret every decision made before it. these were little bursts of flavour, crunchy on the out and al dente on the in, the c-bomb was the perfect side dish for me! chick'n patty, coleslaw, cheese, pickle and homemade spicy bbq sauce, it was everything i was looking for in a chicken burger - except the patty. the cheese was fine, it even melted the way it should have, but the patty.. i dunno, man, it's not just the right texture for chicken! these patties are basically another meat alternative - you know the type, rendered from soya and full of protein, so they're a lot better for your insides that the meat they're trying to replicate, but.. my brain won't let me eat it and be satisfied that it's the perfect sub. besides that, though, it was a tops combo. the slaw was spicy and the bbq sauce was sweet, and like i said - the fake cheese was cheesy enough too! all in all, it was a smashing burger! uhmmmmmm yeah ok, so it wasn't on the menu on-site, but when i saw it on the menu in the pub i was like, screw all the other foods i just want this and only this. 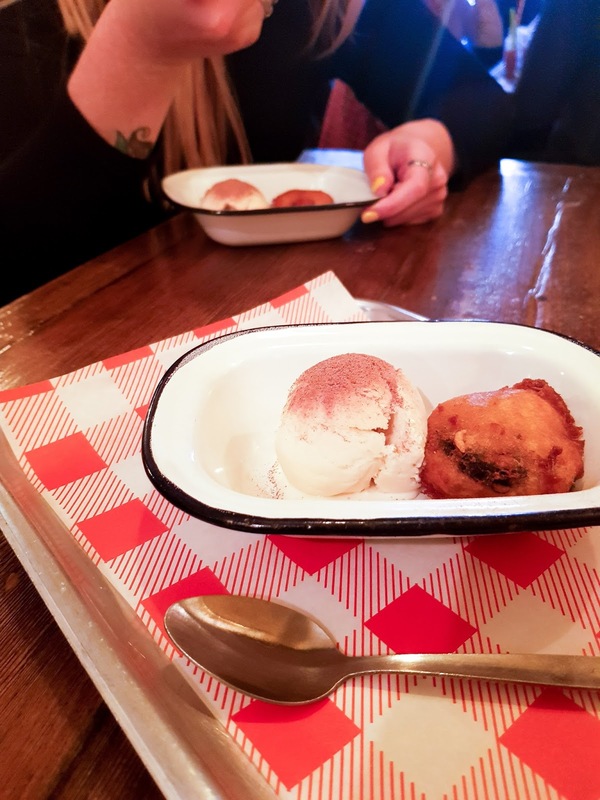 picture the scene: double stuffed oreo, covered in cornflower batter, deep fried, and served with vanilla soya icecream with cinnamon on top. *insert licky lips emoji here* the oreo cream was all melty and gooey, and the biscuits themselves so soft that they operated a bit like cake.. and it was just plain delicious. and so damn full. seriously, the best thing about healthy junk food is that it actually keeps you full for hours, unlike its meaty, fatty alternative friend that keeps you high for an hour, and makes you hungry soon after. so, yeah. it was a great meal in a nice little place, not too far from my place. if you can throw me some more junk food recs, i'd love to see what else is out there!